A typical symptom of Rhizoctonia infection is a reddish brown lesion or canker at or near the soil line. The decay is a dry, firm rot in contrast to the soft, watery rot caused by Pythium or Phytophthora. Photo: Dean Malvick, University of Minnesota. Click on image to view a larger version..
Rhizoctonia root rot is caused by Rhizoctonia solani, a common fungus present in nearly all soils. Rhizoctonia generally lives on decaying plant residues, but can sometimes can be a troublesome root pathogen. 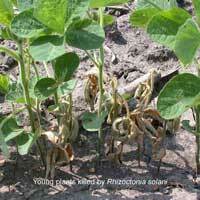 Infection by Rhizoctonia fungi causes damping-off, stem rot, and root rot of soybean and other crops. 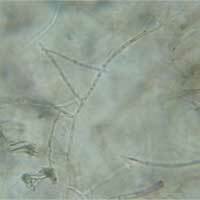 There are many strains or races of Rhizoctonia solani that infect a wide range of vegetable and field crops. The type that infects soybeans can also infect other legume crops, sugar beets, some vegetable crops, and weeds. Generally, any factor that slows or delays plant growth will favor infection by Rhizoctonia, especially during periods of warm, wet weather or when fungal populations are high. Certain herbicides have been shown to affect Rhizoctonia severity. 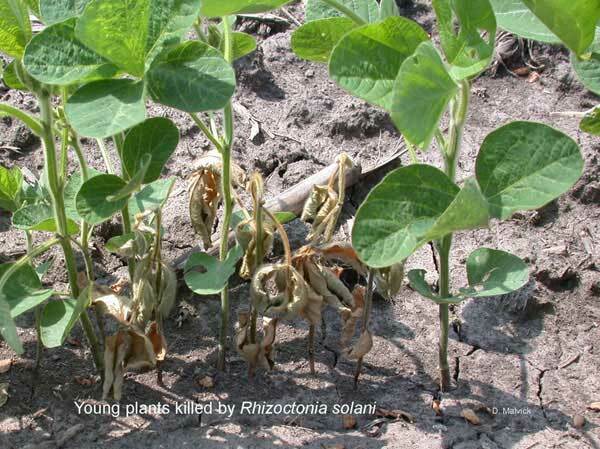 Herbicide applications that cause stress on young plants will make them more susceptible to injury by Rhizoctonia. Some herbicides inhibit soil microorganisms which normally compete with Rhizoctonia, allowing a rapid buildup of the fungus. Rhizoctonia can invade tissues at wound sites. Injury caused by soil insect feeding, SCN feeding, hail injury, or mechanical damage from equipment can predispose plants to infection. Rhizoctonia has the biggest impact on young seedlings. Although not common, plants can be killed if wet conditions persist, and stand losses can occur. Older infected plants may be stunted, which can result in undersized seed. Yield reductions are generally slight (up to 10%) where stunting occurs. Rhizoctonia solani survives in soil as sclerotia (resting structures) and on decaying plant material. Sclerotia in soil or on plant tissue germinate to produce hyphae (fungal strands) that infect a wide range of host plants in a wide range of soil types. Soybean can be infected at any stage of growth, but infection of young seedlings tends to be most apparant and most damaging than infection of older plants. The most common symptom of Rhizoctonia disease is "damping-off" — when seedlings fail to emerge, or seedlings are killed right after emergence. Other soil fungi, such as Pythium and Phytophthora, also cause damping off, and it's difficult to determine which fungus, or combination of fungi, is causing the damage at this point. On older plants, or those plants that survive seedling infections, look for a sunken, reddish-brown lesion or canker on the lower stem near the soil line (see photos). This symptom is fairly diagnostic for Rhizoctonia, as the lesions caused by Pythium or Phytophthora tend to show up as a darker, more water-soaked decay. A potential look-alike, however, is Mycoleptodiscus root rot, a disease caused by the soil fungus Mycoleptodiscus terrestris, which can cause reddish lesions similar to those caused by Rhizoctonia fungi. Do your best to diagnose a damping off or root rot problem in your field and make a note for your next planting. There are fungicides available to protect seedlings in heavily-infested fields, but it's important to distinguish between fungi such as Rhizoctonia and Pythium so that an effective product is used. 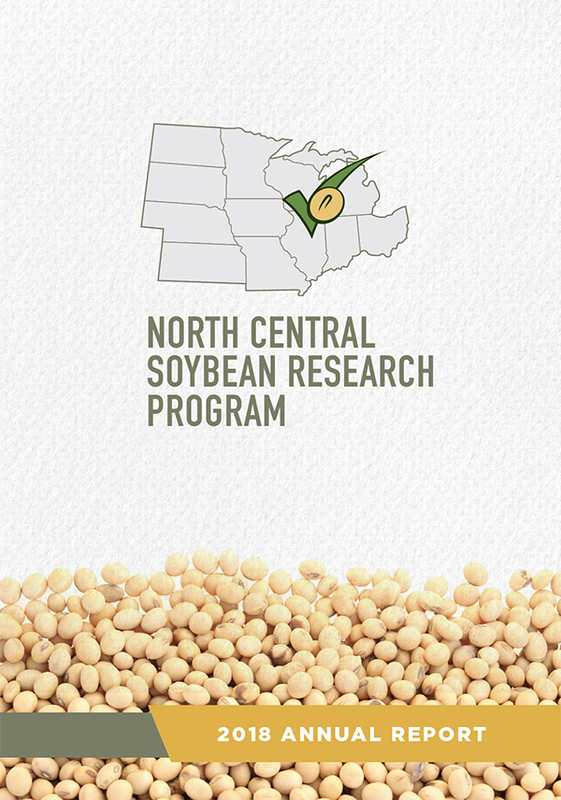 Under normal growing conditions, soybeans generally outgrow a light infection by Rhizoctonia. However, under highly favorable conditions such as wet weather or plant stress, the decayed area can continue to expand into the stem and roots, causing girdling and/or root rot. This injury may show up later as wilting when dry soil conditions occur. If the plants are dug, look for the dry, reddish discoloration of the inside of the taproot which is characteristic of the disease. There are no effective methods to treat Rhizoctonia once infection has occurred. Fortunately, plants will often outgrow a light infection. If the disease is causing a light root rot which reduces plant vigor, cultivate to mound soil around the base of the plant to promote root growth above the diseased part. 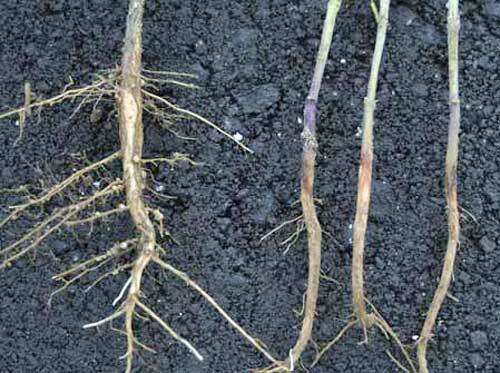 Good soil and residue management can be effective in preventing problems with Rhizoctonia. Rhizoctonia is generally kept in balance by other fungi in well‐managed, biologically active soils. Rotate with non-susceptible hosts such as small grains and corn to allow for soybean residues to degrade thoroughly. Avoid close rotations with sugarbeets or dry beans if there is evidence of Rhizoctonia in the field. Plant seed of good quality. Plant certified, disease-free seed with a known cold germination of at least 70% or a warm germination of at least 85%. Avoid chipped, cracked, or discolored seed. Vigorous seed is especially important where conditions do not favor rapid germination and emergence. Plant at the proper planting depth. 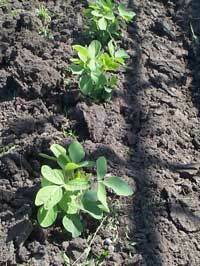 Do not expose seedlings to herbicides. Do not over-fertilize. Test soils before planting and maintain proper balanced fertility and pH based on a soil test. Consider that germination will be quickest when soil temperatures are greater than 65°F. If planting in reduced tillage fields with a history of Rhizoctonia problems, delay planting until soil under the residue cover has warmed. 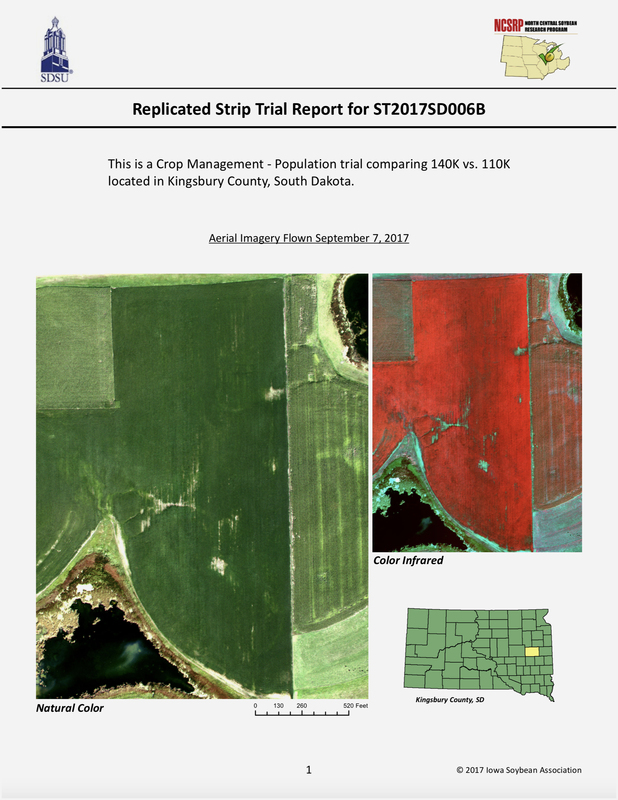 Consider a fungicide seed treatment in fields that have a history of seed rot, damping off, or stem and root decay, or in fields that are prone to slow germination. Treat seed with a protectant fungicide which will control Rhizoctonia. It is critical that the correct fungicide treatment is used for effective disease control. Seed treatments with bacteria or beneficial fungi (biological fungicides) designed to colonize the root system are available and have shown some control of Rhizoctonia. Characteristic red lesions of Rhizoctonia infection, as well as stem and root rot is visible on severely infected plants. A healthy root system is on the left. Photo:Alison Robertson, Iowa State University Click on image to view a larger version.